This is the first pattern I’ve ever designed, so if there are any issues with it let me know. 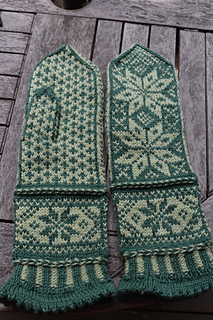 They are inspired by my love for Norwegian knitting styles and mittens. I love mittens. I do have smaller hands, and these don’t have much give, so keep that in mind. My hands are 6 1/2 inches long and three inches wide. the mittens from tip to cuff are 12 inches long, and around 4 inches wide. You will need two skeins, in two different colors, a set of size one double pointed needles, and a tich of scrap yarn. 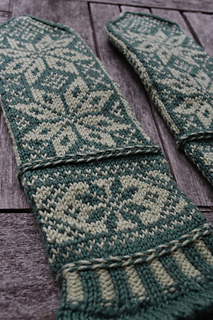 At the cuff chart you will be able to know if the mitten will fit your hand or not. If it is not fitting and you do not wish to change your needles or yarn you have the option to expand the mitten by adding additional edging. On the hand of the mitten as well as the cuff there is a C1, C2, C1 pattern on either side. It can be increased to C1, C2, C1, C2, C1.